How often should I get massage? I get a lot of great questions from my clients about what their particular treatment plan should look like. It is a wonderful part of the job that I get to sit with an individual, look at their life, stresses, pains and goals and help them create a plan that will improve their overall well-being.One of the questions I get all the time is: “How often should I get a massage and what type of massage should I choose?” The answer is very individualized but I do have some general guidelines that I work with when helping a client choose a treatment plan that will work best for them. There are many factors that can effect how often you should get a massage. The best way to decide is to have a discussion with your massage therapist. They will be able to give you recommendations based on your lifestyle, injuries and health care goals. The way you incorporate massage into your wellness plan is a personal choice and in the end you know what is best for you! 1 massage per week or more depending on your injury and other types of therapies you have included in your health care plan if you are recovering from a recent injury. 2 massages per month or more depending on how much lasting relief you get from each massage if you have a chronic issue that is causing you pain. 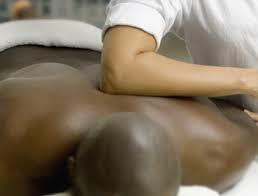 1 massage per month or more depending on your situation for maintenance and injury prevention. It is always important to remember that it may have been years of bad posture, habits or other repetitive actions that have lead to your current issue which means it most likely won’t be a simple fix. Regular body work and self care is essential for creating lasting change in your health! Swedish/Relaxation massage – This is the most common type and uses five styles of long, flowing strokes to reduce stress and pain in the body. Swedish massage is great for nearly everything, including stress and pain relief, injury recovery, prevention and so much more! Deep Tissue massage – Deep tissue massage is a focus on the deeper layers of muscle as well as the connective tissue and is typically slow, deliberate and focused work. Deep tissue massage can be great for treating injuries, chronic pain, range of motion restrictions and many other issues. A common myth about deep tissue massage is that it must be painful in order to be effective. Deep tissue massage may be slightly painful on occasion as your therapist works through adhesion and resistant tissue but this is not always the case. In fact working too deeply too quickly and causing excessive pain can do way more damage than good by causing stress and trauma to your already tight muscles and fascia. You may even choose to begin your treatment plan with Swedish massage until the superficial tissue has relaxed enough to have effective results from deep tissue work. Keep in mind that your massage therapist is always trying to work with your body to promote healing. How long should my massage be? You can typically choose from 30/60/90 minutes of massage (and often more). A 30 minute focus massage might be great for you if you have one specific area that you are focusing on such as low back, neck, foot or wrist. You might consider several weeks of short sessions on one particular area to reach a desired goal. A 60 minute session is great for; full body relaxation, some focus work on a particular area combined with some relaxation work, or it can also be great for a combination of focus work on two different areas of the body. 90 minute massage treatments are wonderful for; extended relaxation work, focus on one area of the body combined with full body relaxation, or focus work on more than one area combined with light relaxation work. The combinations are endless! Just keep in mind that you should book enough time in your treatment to accomplish small goals (ie. 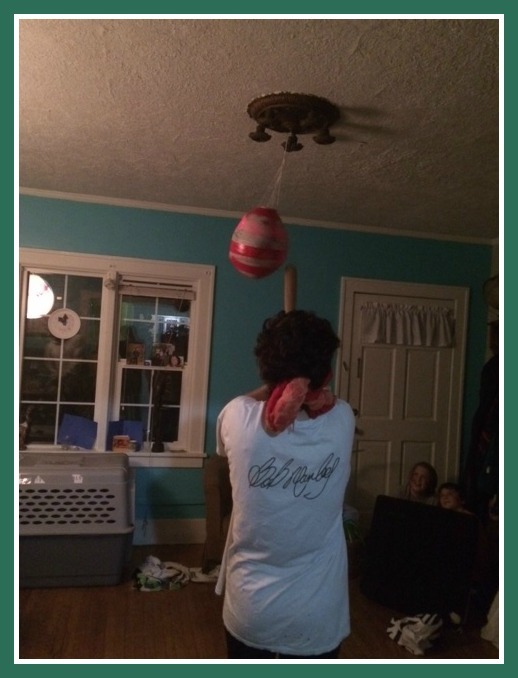 you have slightly more range of motion in your bound up shoulder) and work toward your greater goal (ie. you have full range of motion in your shoulder). Have more questions about massage? Add them to the comments and we will do our best to cover them in our weekly blog posts! Thank you for reading and have a great week. Have you ever wondered about massage for kids? If you have kids in your life you are already in tune with how much more magic they bring to your days. Spending time with kids has always been something I love and let me tell y0u, most kids are ecstatic about massage! My niece and nephews are always asking me when it will be a good time for their next massage, it calms them and makes them feel good about their bodies. It gives them quiet time to explore sensations and ask questions about this amazing vehicle each of us are traveling in. Believe it or not kids get tight muscles and pain too and though they aren’t yet locked into unhealthy movement patterns, they are learning certain behaviors that they will carry with them throughout their lives. This is a great reason to begin addressing issues of tension in both mind and body beginning at a very young age. Recently I have had many clients mention bringing their kids in for a massage and so I thought it would be a good time to share some ways that massage can benefit kids and what types of treatments it is appropriate to book them for. “Massage reduces stress hormone levels and blood glucose levels. According to Maria Hernandez-Reif, a researcher at the Touch Research Institute, lower stress hormones not only reduce feelings of anxiety but contribute to a healthier immune system.” –Maggie Lynn, Read more at Livestrong.com Obviously this is a benefit to all people who get massage! Massage reinforces positive feelings about self-worth and body image in kids (we might say adults as well). Touch is essential to a healthy life and we all thrive when our lives include regular positive touch-especially from those we care about. You might even enjoy giving your child a massage every day before bedtime to help them relax and create a time for positive reinforcement and bonding. Not sure how? You can always book a session and stay to observe, we are happy to give you some tips on the best ways to offer massage to your child. Massage can greatly benefit children with special needs including everything from weight gain for pre-term infants to hyperactivity to various sensory issues. Each of these requires and in depth review but a great place to start is with this article from ABMP titled Children and Massage. 4 years old to 12 years old: We recommend starting with a 30 minute Focus! treatment here at Written on the Body and you are welcome to stay for any part or all of the treatments with your kids. You can also book your own treatment at the same time and make it a parent/child date! During this 30 minute focus massage your child could remain clothed and we would employ gentle massage techniques on the table such as rocking, compression and other aspects of Swedish massage. 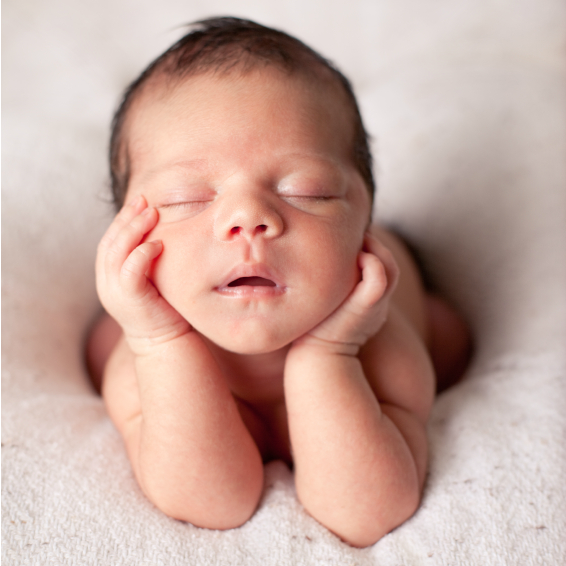 If appropriate we may use warm compresses or essential oils to enhance relaxation and keep your child’s attention. We always leave room for your child’s needs and will allow them to direct the session including the right for either of you to end it at any time. 13-17: At this age many kids are able to handle longer sessions and you might consider gradually increasing the length of their treatments until they are eventually able to handle a full hour. They may also be ready for other types of massage such as hot stone, deep tissue or sports massage and you can discuss these options with our team as you and your child feel it is appropriate. Thai Massage: Thai massage is clothed and performed on a mat on the floor. During Thai massage your therapist will compress, rock and stretch your body in various ways with the goal of deep relaxation, improving movement patterns and lengthening muscles. Thai massage is an excellent option for ages 4 to adults (and sometimes even younger)! If you are interested in finding out more about booking a Thai massage for you or your child email us at wonthebody@gmail.com and we will happily help you book an appointment. Whether you decide to start a home massage routine with your child or book an appointment with your favorite therapist we are excited for you to start this journey! Ready to book? Click here to view our schedule online (when booking for your child please make a note for your therapist of your child’s age so that we can be prepared for the visit). Have more questions? Leave them in the comments or email us at wonthebody@gmail.com. Thanks so much for reading and have a wonderful day! Is pain after a massage normal? Have you ever gotten a great massage only to have pain the next day? Pain after a massage can be a normal part of healing. Everyone has muscular patterns that have been created and reinforced over time and sometimes these patterns aren’t healthy resulting in inefficient ways of moving. The result is an overall imbalance with some muscles being tight and shortened while others are weak and overstretched. Eventually this can cause pain and/or injury as well as a sort of numbness. When massage begins to help release these unbalanced muscle patterns, the body has to adjust to a new and unfamiliar way of being, which can feel uncomfortable or even painful for a time. This is also the reason that regular massage combined with a self care plan is so important. As you might imagine it will take quite some time and effort to undo something that took so long to create. Your massage therapist may move your body in a way that it is not accustomed to and just like a new exercise routine it can cause fatigue or soreness the following day or two. Staying active, hot baths with Epsom salts, ice therapy or heat therapy can help ease this type of discomfort as your body adjusts to these new feelings. There is a lot of controversy surrounding detoxification and massage, I don’t want to add fuel to this debate in any way. I will stick to this: massage increases circulation and stimulates the parasympathetic nervous system which can sometimes cause an overload to your mind and body. Especially when it hasn’t experienced these sensations before, recently or if your body’s resources are going toward healing another issue such as an injury at the time of your massage. Drinking water, resting and taking care of yourself in general following a massage is important to lessening the possibility of fatigue or pain response. Not all pain is created equal and it is always important to communicate with your massage therapist during your treatment. You should ask your therapist to lighten up on the pressure if you are experiencing pain during your massage that is sharp, shooting, numbing, tingling or 7+ on a pain scale of 1-10 (1 being very little to no pain and 10 being severe pain). You should always be able to breathe during your massage and if all your muscles are tensed against the pressure it defeats the purpose of trying to get tense muscles to let go. Good pain is ok but beyond that pain is not beneficial to your health. If you are experiencing sensations during or after a massage that seem abnormal you should communicate them to your therapist and if you think something is wrong it may be a good idea to check in with your doctor. In general there is nothing abnormal about experiencing a little pain after massage and it will likely stop happening after you begin to get regular treatments. Should I get a massage? Have you ever thought to yourself “Should I get a massage?” If so then this post is for you! You experience chronic pain-often times people believe they have to live with pain but this is not always the case! Regular massage treatments can help relieve or at the very least lessen chronic pain cycles. You have a difficult time relaxing or shutting off your mind-massage, especially certain types of massage such as Thai and hot stone can be very effective in helping you wind down and find inner peace. You are prone to injury involving pulled muscles and tears-massage truly can help unravel those long time patters of muscle tightness that eventually leads to injury. It is no magic pill but with regular treatments and a good self care routine you will find that you can become more balanced. Saturday night I had the pleasure of hosting an incredibly fun 16 year old’s birthday party that included a super cool game called “essence” where one person internally chooses another person in the room and everyone else has to ask questions about the mystery persons essence to find out who it is ie. “If this person were a flower what type of flower would they be?”. After several rounds of essence, snacks, two delicious types of cake and much fun and laughter we had a fabulous time beating the crap out of a homemade piñata! How is it that teen parties can be so much more fun than many adult birthday parties? This party would have normally ended at the reasonable hour of midnight but of course with daylight savings robbing us of our precious hour we were still cleaning up around 1am. Needless to say I was shocked when I finally met the pillow a little after two and didn’t wake up until almost noon the next day! I never sleep that late! I don’t know about you but the week after we spring forward is one of the most difficult weeks of the year for me. I tend to spend the week in various stages of sleep deprived zombification, so if you interact with me this week please know that my brain is only half alive. Don’t let Daylight Savings take away your sleep! Be mindful of the temperature. Take a warm (not hot) shower or bath about an hour before bedtime, and keep your room cool at night. The drop in body temperature signals your body to calm so you’ll fall asleep faster and sleep more deeply. OK, so you’ve heard this one. But it’s the most important and the least followed piece of advice. Get an old-fashioned alarm clock, so you don’t need to use your phone. Turn your phone, iPad, Kindle, or whatever you’ve got off, and put the devices in another room. Yes, a completely different room. You may think a phone on silent, hanging out on your nightstand, won’t disturb your rest, but it will. Just knowing it’s there puts your body on alert. It’s far too tempting to reach over and “just check a few emails” if you do wake up in the middle of the night. Save yourself. Break this habit. Yup. Massage can help with sleep issues. There have been several studies demonstrating the efficacy of massage in people with sleep problems, especially when treating secondary issues that may impair sleep, like back pain, pregnancy and migraines. 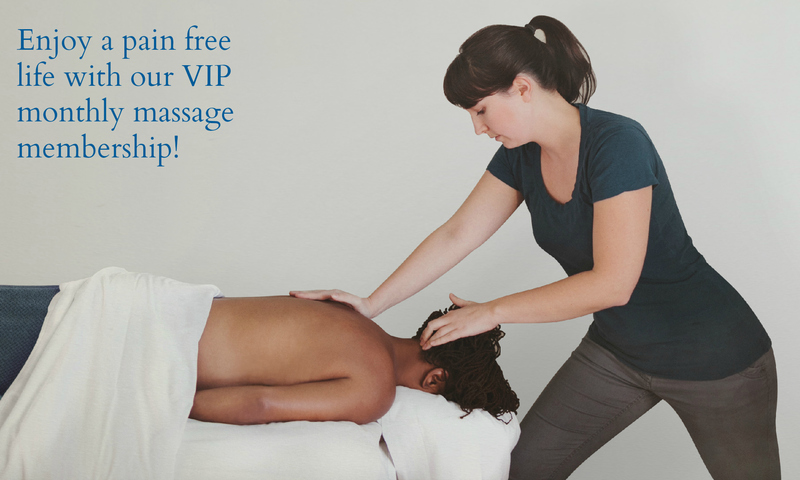 Have you heard about our monthly massage membership program? Regardless of your particular situation regular massage treatments will make a major difference in reducing your overall stress and pain levels. We are learning that stress and chronic pain can lead to all sorts of long term health issues. While at the same time preventative medicine such as regular check ups, wellness treatments and general improvement of diet and exercise can keep you healthy. Not sure how to get started on monthly massage appointments? We can help! We have many options in our VIP monthly membership program and this month we are waiving the sign-up fee! Monthly payment is $55 and it includes one 60 minute relaxation massage (billed monthly via credit card with a 6 or 12 month contract). Unused massages roll over but must be used by expiration of 6 month contract. You will be added to the “happy hour list” to receive the benefit of our weekly discount offers. To add additional massages per month it will only be $60 per 60 minute relaxation massage. Don’t have a lot of extra time? Sign up for our monthly 30 minute Focus! massage membership for only $25 a month! Make an appointment by texting 971 800 1171, or book online. Add yourself to our mailing list to receive our happy hour massage specials!